Creates one or more viewports in layout tabs (short for "make viewports") to display entities drawn in Model tab. Each viewport can have its own settings, shown below. Note: This command is for making viewports in layout tabs. To create viewports in Model tab, use the VPorts command. 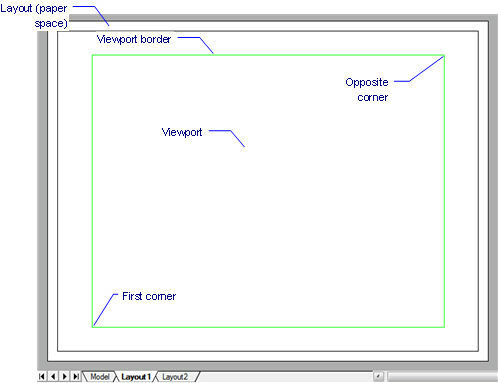 Specifies one corner for a new, rectangular viewport. Pick a point, or enter x,y coordinates. 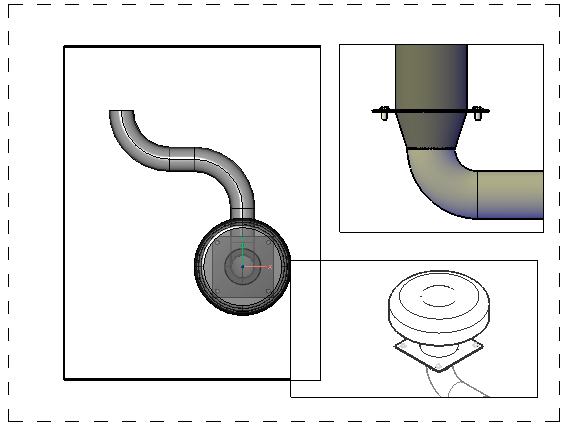 Specifies the other corner for a new viewport. Select viewports to turn on - choose one or more viewports. Select viewports to turn off - choose one or more viewports. This option hides the content of the viewport; the viewport border remains visible. To hide the viewport border, place it on a separate layer, and then freeze the layer. Viewport locking [ON/OFf] <On> - type ON or OFF. Set the scale factor with the Zoom command's XP option. Draws a rectangular viewport that fits the current layout. Two viewports [Horizontal/Vertical] <Vertical> - enter an option. Opposite corner - Pick a point. Three viewports [Horizontal/Vertical/Above/Below/Left/Right] <Right> - enter an option. First corner of bounding rectangle or [Fit] - Pick a point or choose the Fit option. Draws one viewport above two side-by-side viewports. Draws two side-by-side viewports above one viewport. Draws one viewport to the left of two stacked viewports. Draws one viewport to the right of two stacked viewports. Select an object to clip viewport - specifies a closed object. 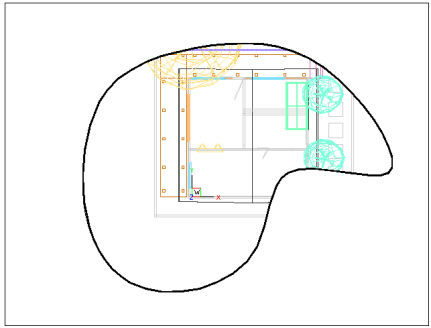 The viewport is traced over the object; the original object remains in the drawing. This option is useful for ensuring a viewport border precisely matches an outline. Specify start point - specifies the starting point for the polygon. Set next point or [draw Arcs/Distance/Follow] - specify a point, or enter an option. Set next point or [draw Arcs/Distance/Follow/Undo] - specify a point, or enter an option. Set next point or [draw Arcs/Close/Distance/Follow/Undo] - specify a point, enter an option, or press Enter to close the polyline. Use the Draw Lines option to exit arc drawing mode. Close - closes the polygon and exits the command. Distance for segment - type a value. Angle of segment - type a value. Set next point or [draw Arcs/Distance/Follow/Undo] - pick a point or enter an option. Undo - undoes (undraws) the last segment. MvSetup - creates multiple paper space viewports; in model space the command creates a rectangle, representing a paper sheet with respect to a specified scale. MSpace - switches to model space. PSpace - switches to paper space. VPorts - creates viewports in model space. RedrawAll - redraws all viewports. RegenAll - regenerates the drawing in all viewports. Zoom - utilizes the XP option to specify the zoom factor in paper space relative to model space.